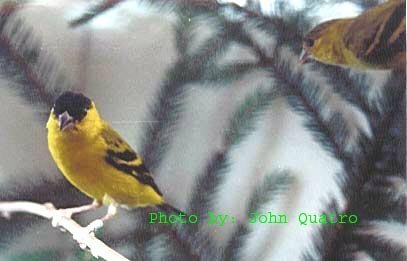 American Goldfinches, often called "Tristies", are one of the two species of Siskins which undergo seasonal change of plumage. The male is almost identical to the Yarrell's Siskin, the only difference in plumage is that the wing bar of the Yarrell is yellow while the wing bar of the Tristis is white. The primary flights in Tristis are all black and the bird is slightly larger than the Yarrell Siskin. Their diet consists of Thistle, Niger and Sunflower seeds with lots of green seeding grasses and green leafy foods (lettuce, spinach, broccoli, etc.). In captivity, some soft food is recommended as well. Although one of the most common specie in the North and Central America, not many are aware that there are four subspecies and the ones that do cannot describe the difference. It is so difficult to obtain information on most small birds, many become extinct before anyone realizes what has happened. Luckily these birds are not threatened and hopefully never will be. They are easy to keep and breed when kept in aviary, they are not suitable for cages. All of the three Andean Siskins are similar except for the Spinus spinescens nigricauda which has a completely black tail. They are often seen in the wild in small flocks feeding on the ground mostly at an altitude of 1800-3700m. Distributed from Venezuela throughout Colombia to northern Ecuador. In aviculture I have seen them in Europe. They are also kept in North America Aviculture. 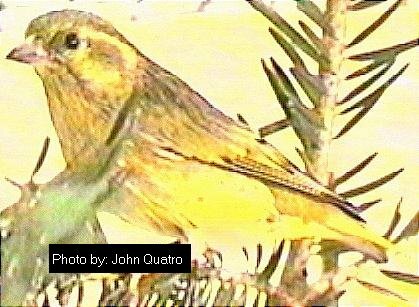 Photo from Dr. Classen's " Handbuch der Cardueliden"
This specie is found in the mountainous pine forests of Hispaniola, Haiti (Caribbean). Very little if anything has been published about this specie. Most bird species on Caribbean Islands are threatened, including this little bird. 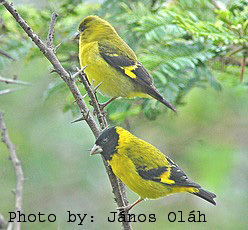 According to some rare descriptions, morphologically this bird is similar to the Black Hooded Siskin of South America. I have not been able to locate anyone who bred/breeds these birds in captivity. In its Native land it is known as "Canario". I have seen them only once in a bird shop while taking photos of some birds, thinking they were probably one of the African Weaver finches. Although the shop assistant kept insisting they were Spinus dominicanus I unfortunately wasn't convinced and didn't take a photo. It is native to the mountains of S.W. Mexico, Chiapas and Guatemala. 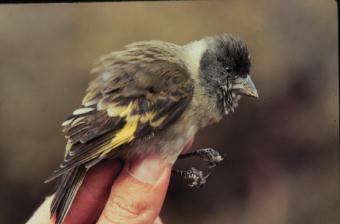 The male is similar to the female Hooded Siskin. The only difference is that it has a black crown and the bird overall is more yellow-green. Due to its subdued coloring it is not a popular bird but nonetheless it is rare and is kept exclusively by the Siskin enthusiasts. The males have much more yellow in their plumage than this photo suggests. 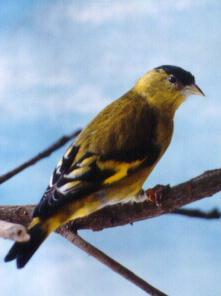 Photo from Dr. Classen's "Handbuch der Cardueliden"
The male is very similar to, but slightly larger than the male European Siskin (Carduelis Spinus) it also has a little brighter yellow on its head and flanks without streaks. 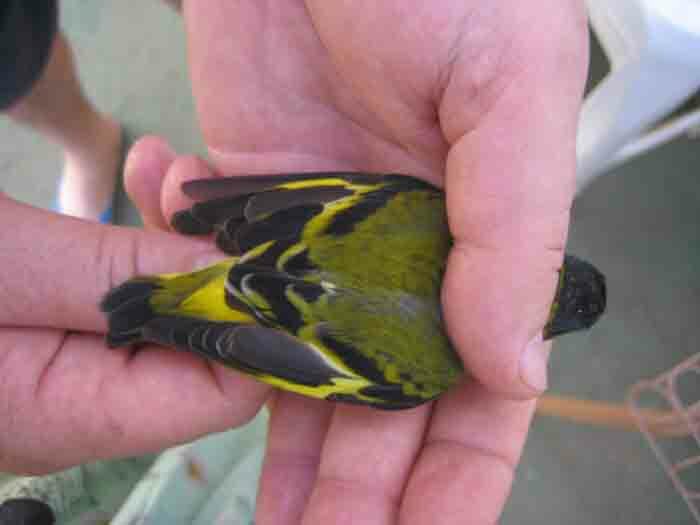 The wing markings are almost identical to that of a Hooded Siskin markings. The crown and chin are black just as in the European Siskin. The female is similar to the Hooded Siskin female but duller. 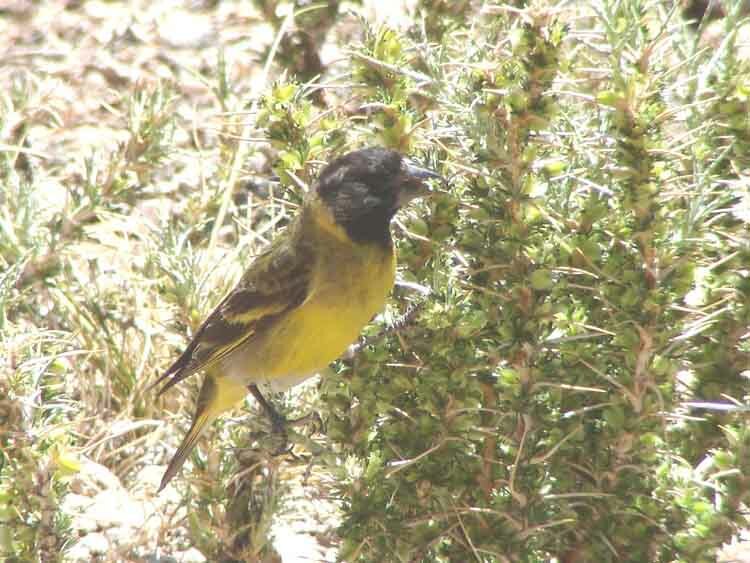 It is native to the southern parts of South America, Chile, Argentina and it occurs farther south than any other Siskin, to Tierra del fuego and the Falkland Islands. Black chinned Siskin is found only to about 1500m altitude. This specie is very popular in Aviculture and I have seen up to twenty young being produced from a single pair in one season. Photo 2 and 3 were taken by me in Santiago - Chile. Photo 1 from Dr. Classen's "Handbuch der Cardueliden"
Black Headed Siskins are very small birds, a little larger then the Red Siskins. Both male and female have black head. They are almost identical to the male Hooded Siskin but smaller. The male is easily identified by its black head feathers extending to its chest. It is native to Central America, from Northern Mexico to Nicaragua and is found in highland regions at an altitude between 2000-3000m. In aviculture it is a very popular bird and they breed quite freely providing lots of Niger and sunflower seeds are included in their diet, as well as a lot of green seeding grasses, millets and green leafy plants like lettuce etc. I am still unable to describe the subspecies, if anyone can help please let me know. Their length being a little over 13cm makes it one of the larger Siskin species. The male is glossy black with a bright yellow lower belly. The edges of the outer tail feathers and the wing bar are also yellow. The female is black but not as glossy and has a greyish white belly. In the wild it is fairly common in high puna grasslands on rocky slopes and ravines. Usually seen in pairs or small flocks often foraging on the ground. Black Siskins are native to the Andean Mountains of C. Peru, W. Bolivia, N. Chile and NW. Argentina. Mostly from 3000-4000m. In captivity I have seen them in South America and in Europe, they are also available in the north American Aviculture. 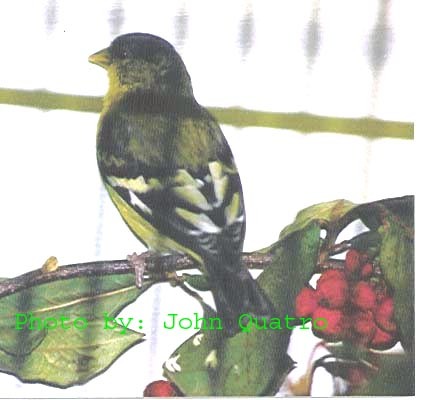 Keeping and breeding them is basically the same as for other Siskin species, it is very hardy and it adjusts well when kept in aviaries and not cages. They are one of the commonest Siskin species in captivity. The Cape Siskin is about the size of a Hooded Siskin (12cm). Its' back, wing coverts, rump and the upper tail coverts are chocolate brown. The head, nape and sides of neck are yellowish gray and olive. Fine dark brown streaks are most prominent on the head and the sides of the throat, while the flight feathers (only in the P.t.totta), have white spots on the tips. Its inquisitiveness and its charming twittering makes these birds one of my favorite Siskins. Not often considered to be a true Siskin but if it is, it is the only Siskin specie which breeds in cavities and it does not use a canary's cup shaped nests. Carduelis psaltria hesperophilus - N.W. USA and S. Canada. Each one of these birds has its special beauty and charm. I have seen all except for the Carduelis psaltria witti. They are one of the easiest species of Siskins to breed in captivity. If they were freely available in captivity it would certainly be difficult to maintain all the subspecies in their pure form. However, by joining your local Carduelan society and with everyone's contribution to the cause it would be possible. Being good breeders they also make good foster parents for other small Siskins like the Red Siskin and the Yarrell's Siskins. Eurasian Siskin inhabits most of the Northern hemisphere from Iceland through to N. E. Russia and south to Japan. Just under 12 cm in length with its yellow-green and brown streaked plumage and its black crown, this small bird is only second to Eurasian Goldfinch in popularity as a cage bird in Europe. In Holland it is known as Sijs, in France as Tarin des aulnes, in Russia as Chisz, in Spain as Lugano, in Japan as Ma-hiwa and in Sweden as Gronsiska. Eurasian Siskin is easy to keep and breed in captivity and is one of the hardiest of Siskin species. Several mutations have been produced in France, which were shown to me by then president of the International Carduelan Club - France, Mr. Jean-Michel Eytorf. Some of these specimens were real gems. Check out these two Video links of Santa Cruz Siskins filmed by J.del Hoyo/Lynx. All black wings are clearly seen, same as in C.m.alleni, the obvious difference is the white belly. These birds do not appear to be as dark above as the C.m.alleni and there is substantial amount of gray on flanks, their size is apparently the same. 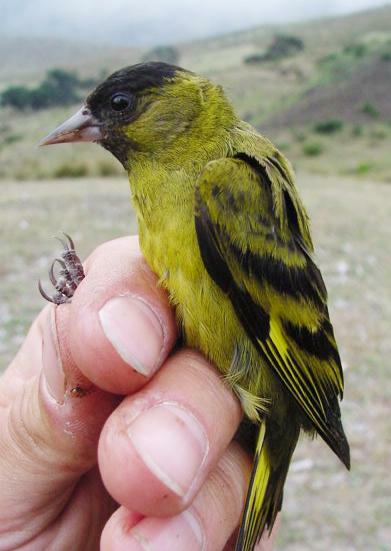 Hooded Siskins are very common and widespread Siskins throughout the most of the South America. Each one of the eleven subspecies is native to different parts of the South American continent and in some they are overlapping. 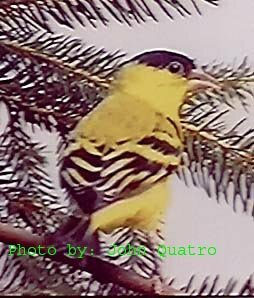 I have been breeding Hooded Siskins for more than twenty five years now, and in my aviaries they breed well. They are easy to keep, easy to breed and are very hardy, providing that lots of Niger & Sunflower seeds and plenty of green seeding grasses and crispy lettuce are included in their diet. The birds kept in Europe and North America are probably of different subspecies to what we have in Australia. It is important to keep the subspecies pure in captivity. This bird is native to South California and North West Mexico. Although it is a true Siskin, it is widely known as the Lawrence Goldfinch. With a length of 10 -11cm it is about the size of the "Spinus notatus". Lawrence Goldfinch is sexually dimorphic so the sexes are easily distinguished from one another. The male has a black forehead, as well as crown, lores, chin and center of throat. The rest of the head and neck feathers are gray with paler gray on the cheeks and ear coverts. The mantle is olive-green with the lower back and rump being greenish yellow. The tail is black with white patches on the inner web of the feathers. The breast and the wing bar are yellow, while the under tail coverts are white. The bill is pinkish in color and the legs are pinkish brown. In Aviculture they are very rarely kept and only by Siskin enthusiasts. It probably is the most expensive of all the Siskins found in captivity. They breed freely but only if kept in aviary, they are very territorial and they require lots of green seeding millets and grasses. To keep them alive and healthy their water must be kept clean, most breeders use Aviclean or one drop of Iodine/10 litre of water. It closely resembles the Hooded Siskin and it is easily distinguishable by its six white panels on its black fight feathers. Both sexes have yellow under parts, quite strongly tinged olive. Olivaceous Siskins are slightly smaller than most races of Hooded Siskins, they are found at elevation of up to 3000. It ranges from Ecuador, Peru to Bolivia. These birds are still kept by some members of the Carduelan Society. As for the breeding and keeping they are not difficult specie, basically the same as for the Hooded Siskins. This brownish bird is heavily streaked with gray and black, with black being on its primary flights and tail feathers. Pine Siskins are about the size of the European Siskins. They adapt well and will breed freely in captivity. Over the years I have been trying to obtain information about the three subspecies and their difference in size and color but no one seems to know, even some Ornithological Societies and Museums could not give me the answer. There's no need to emphasize that information about smaller birds is more often not available, but for some reason all information needed is always there about the larger birds like the Eagles and Macaws. 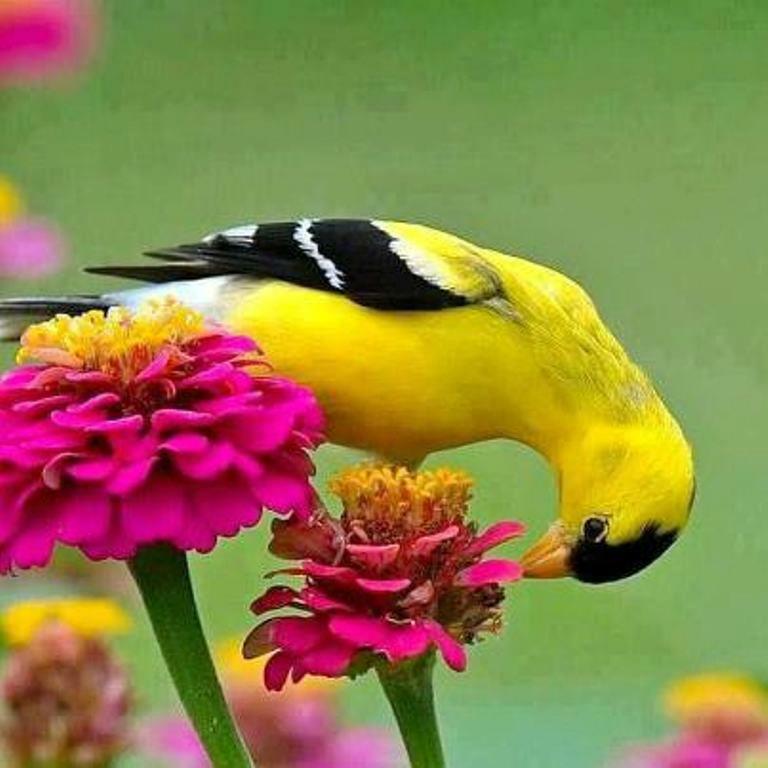 There is no doubt that this is one of the most beautiful finches in the world. Unfortunately they are just about extinct in their native Venezuela. If strong measures are not undertaken to save this specie in the wild, then they will be history within a few years. If their purity is not maintained in captivity, they will remain only as hybrids, mutations etc. In Australia we have a battle on our hands to save the few remaining pure specimens left in captivity. I have kept and bred Red Siskins for more than twenty years now, and providing that lots of Niger and unhulled sunflower seeds along with some green food is offered, they could easily be established in captivity and then reintroduced back into the wild. I have not been able to find out much about this specie except that they are native to the mountains of Ethiopia. Some aviculturists claim that this bird is not a Siskin but a Serin. The last report that I have received from Africa was that they are very common and that they are easy to spot. There are a number of song birds described by Ruppell in his book (published in 1840). This bird is also known as Abyssinian Siskin and African Black Headed Siskin. The crown, ear coverts and the throat are black and the rest of the bird is olive green. If anyone has any information on this bird in Aviculture, I would like to hear about it. Saffron Siskins are native to Ecuador ( South America). Von Berlepch and Taczanovski named it after geologist Dr. Joseph Siemiradzkii who collected some specimens near Guayaquil some years earlier. It is very rare in the wild and I doubt if anyone has shown any concern about this specie. It occurs at altitude below 800 m. I have not seen them in captivity, and if they exist they are very rare. The birds which I have seen were a pair in Frankfurt Museum collected by Dr Siemeradzkii himself, although collected 150 years ago they were still in excellent condition. They are often described as being the smallest of all Siskins and they were, may be because of their very short tail. Their overall color patterns are typical to other Hooded Siskins species, and its unmistakable feature is its saffron breast, rump and under tail coverts. I haven't been able to find out if anyone keeps this specie in the USA but I imagine they are available and kept by someone, according to the European Carduelan breeders they were once kept in Europe but there is doubts if they still exist. Some scientist consider Saffron Siskins as a race of Magellanicus which is puzzling if anything they would be more related to the Red Siskins then any other Siskins. As for the breeding results in captivity, nothing has ever been published. Illustration - Giorgio de Baseggio - "Cardellini e Lucherini"also in" Finches and Sparrows"
Thick-billed Siskins are the largest of all Siskin species, it's overall feather lenght is 14 cm their colors are similar to the Hooded Siskins. Their wings and back is much darker mottled then most of the other closely related C.magelanica races. Subspecies Amadoni are slightly more gray then the Crossirostris. The Thick Billed Siskins are easily recognized by their much thicker bill at the base, from other closely related Hooded Siskin species that are more commonly found at lower altitudes - below 3000m, while the Thick Billed Siskins range from 3000-4000m. They are uncommon throughout their range but in some areas at certain times of the year (Spring) they are everywhere so their status appears to be stable. In captivity, I am only aware of this specie in Europe, but there may be some birds bred in Argentina as well. Photo by: 1.) 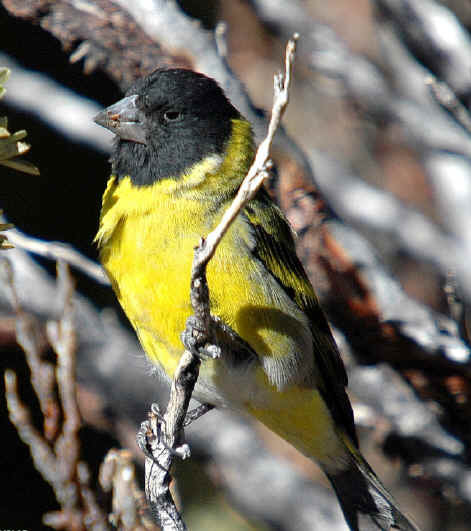 - Robert S.Ridgely & Guy Tudor "The Birds of South America"
Known by everyone as the Himalayan or the Tibetan Siskin, it is native (as the name implies) to the Himalayas. There is not much known about this little bird in fact most people have never heard of Himalayan Siskin before, breeding patterns in the wild is still a mystery, in captivity they build cup-shaped nest, the rest is basically the same as for other species of Siskins. One of the International Carduelan Society member's owns two pairs, and in the past couple of years breeding successes were reported by several other Aviculturists as well. Feeding and maintenance as for the European Siskins. 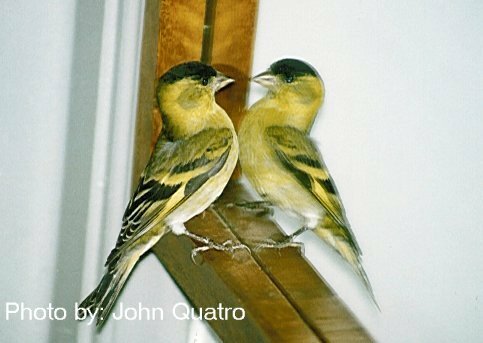 Males in the wild or when kept outdoors are rich yellow while the birds kept indoors lose their color drastically, the males turn into olive-yellow while the females are heavily streaked closely resembling the European Siskin female. The Yellow Bellied Siskin male in its full color plumage is something that has to be seen to be believed. With its glossy black wings, head and the upper breast and its golden yellow wing bar and upper parts, it is often said that this bird looks more like a butterfly than a bird especially when observed in flight. 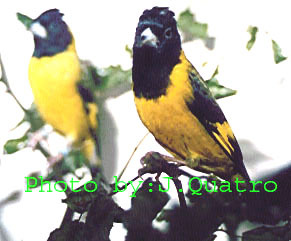 The subspecies Spinus Stejnegeri is slightly larger and the yellow breast is lighter shade of yellow or lemon yellow. 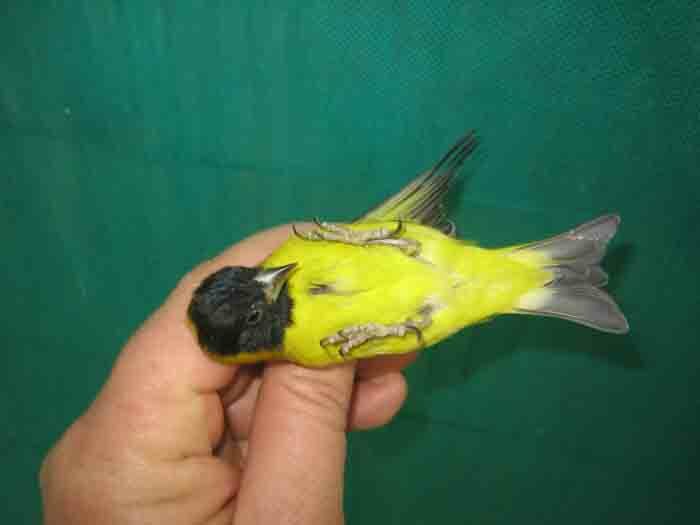 In captivity in general the Yellow Bellied Siskin adapts well and becomes very tame to the point that it will take seeding grasses from your hand. Propagating this specie in captivity is not difficult, better results are obtained when kept and bred in an aviary. Yellow Faced or also known as the Yarrell's Siskin is one of the most beautiful Siskins in the world. This tiny Siskin is about the size of the Yellow Breasted Waxbill. It is now protected specie in its native Brazil and Venezuela. Breeding them in captivity is difficult but not impossible. Due to their status in captivity they are not often available and are very expensive. 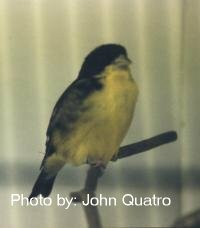 Better results are obtained when kept and bred as a single pair per small aviary or by fostering eggs to other Siskin species or small Canaries. Photos from Dr. Classen's book "Handbuch der Cardueliden"